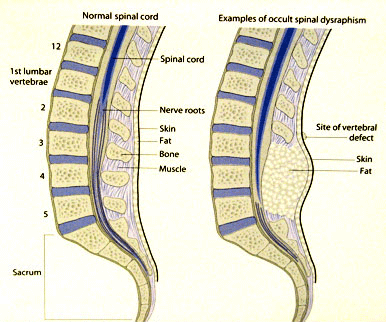 The spinal cord includes the bundle of nerves that controls leg movement and sensation as well as bladder function. The spinal cord typically divides into small nerve roots at the L2 vertebral body. During development of the spinal cord, tissue and fat, or other body elements that do not belong near the spinal cord can become attached to the spinal cord. Sometimes the tissue prevents the normal development of the spinal cord so that there are problems with urination and leg weakness. In most cases, there are no problems at birth. As the body grows, however, the spinal cord then becomes stretched and damaged by the abdominal attachment. This condition is called a tethered spinal cord. 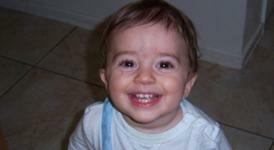 If left untreated, your child may suffer nerve damage as he or she grows. The condition can be treated with surgery to prevent future nerve damage. Stumbling or changes in gait or walking. Trouble with bowel or bladder control, such as difficulty in toilet training in a toddler, keeping a dry diaper with a baby, loosing control in a toilet trained child or no being able to hold urine until getting to the bathroom. The diagnosis of a tethered spinal cord is made by obtaining a Magnetic Resonance Imaging or MRI of the spine. Needles are inserted into the lower body to monitor nerve function even as the child is asleep. Releasing the tethering lesion; can be simple or highly complex requiring many hours or dissection under the microscope. At times we use a laser to sharply dissect tissue from the nerves. The images below show the lesion before it is cut (left), the lesion after it is cut (center), and the lesion released (right). Closing the dura or available tissue over the spinal fluid. Surgery for a tethered spinal cord can prevent future irreversible nerve damage which can severely affect a child's bladder and leg function and quality of life. A follow-up MRI is usually performed sometime after surgery. On rare occasions, years after the original surgery, a re-tether may develop for certain types of tethered cords causing radiating leg pain, persistent back pain or bladder problems. This situation may require additional surgery.